"Behold, you are beautiful, my love; behold, you are beautiful"
I've always dreamed of photographing an elopement. There is something so powerful about the minimalism. Putting aside a big party to curate a day for just two people in love vowing to be together forever. 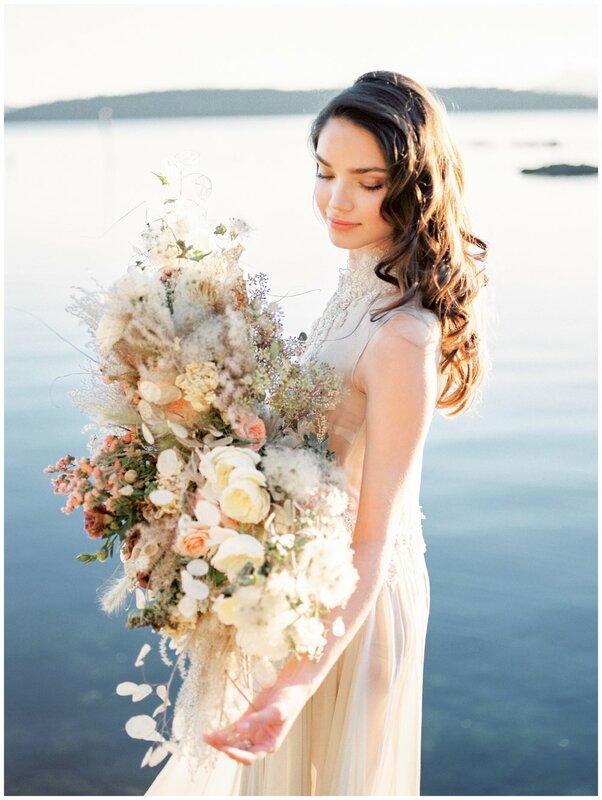 I was so blessed to be able to work with some of the finest vendors in Vancouver for this shoot- Maurelle Calligraphy penned in gold the most gorgeous vows on handmade paper, she was so lovely to meet in person with the warmest personality. Amanda wore a gown from Truvelle bridal- a local store where everything is designed in house for beautiful quality dresses. Quince fine florals put together a naturally loose garden style bouquet bound with raw silk ribbon from Stella Wolfe. Denise Elliott + team gave Amanda's hair loose textured waves and enhanced her gorgeous features with subtle fresh make-up. I met Amanda and Matt in the city while everyone was preparing for a typhoon storm. It had been forecasting torrential downpour all day but I was confident that the weather would hold until our session was over. We went out to Whytecliff and talked about adventures they had been on together and Matt's love for exploring the outdoors. Amanda and Matt find joy together in what seems to be anything; they are quick to smile and laugh together. When we packed up ready to drive back, the rain came. I was so grateful for the timing of it all. The stone steps of the cliffside were my favourite part about the location Matt had chosen. With an old world charm it was comforting to be standing in view of our Canadian coast. The giant swaying trees creaked cordially. The sound of waves lapping the rocks and the wind filled with mists of salty water are things I crave when I got back to my prairie home. If you are planning a beautiful intimate get-away for your wedding please ask me for my elopement session packages! I'm so excited to be incorporating more of these sessions into my work as they speak dearly to my heart.